A plan backed by two Democratic legislative leaders to boost state spending for public schools by $53 million next year and shake up how the state funds charter and magnet schools is causing disagreements among members of their own party and with the leader of the state’s largest teachers union. 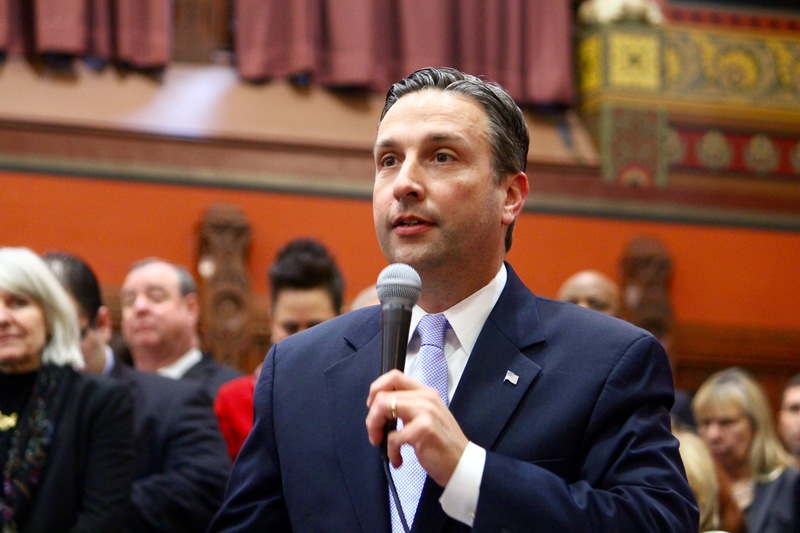 Senate Majority Leader Bob Duff, D-Norwalk, last week began circulating details of the plan to legislators and lobbyists in an effort to generate support for it. It features changes in five key areas designed to fix what a Superior Court judge, Gov. Dannel P. Malloy and others have characterized as a broken approach to distributing state school aid. “This is a once-in-a-generation opportunity and a call to action to fix how we fund schools,” said Duff during an interview. His plan and one released by Malloy in February are the only substantive proposals state officials have put forward so far this legislative session. The current formula for determining how much state aid a school district receives uses a “foundation number,” which it then adjusts based on the district’s enrollment and wealth. For the last several years, the foundation number has been $11,525. State education leaders set this figure based on how much funding the legislature appropriates, not on how much it actually costs to educate a child. Figuring out what the foundation number should be has been an issue this legislative session. 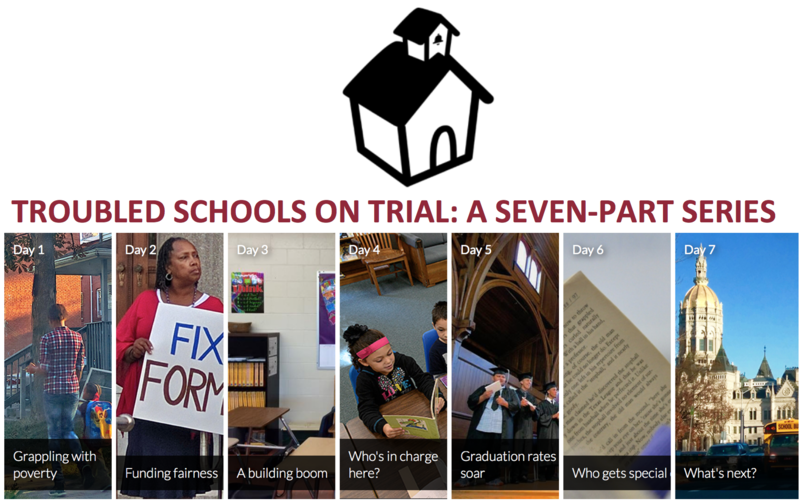 A group of parents, educators and local leaders suing the state over what they say is inadequate school funding – the Connecticut Coalition for Justice in Education Funding – has been pushing the state for over a decade to commission a study, similar to ones conducted in other states, to determine the basic price of an adequate education. Several legislators support doing such a study, including the Democratic co-chairs of the General Assembly’s Education Committee. But the Malloy Administration and several Democratic legislators are opposed, including Duff and the other main proponent of the new plan, Rep. Jason Rojas, the House chairman of the powerful Finance, Revenue and Bonding Committee. “I don’t support doing an adequacy study. This is our opportunity to have meaningful education funding reform this year. My fear is that if it’s not done this year, it doesn’t get done for another generation,” said Duff. “We wanted to look at how we compare to other states and look to other states that are doing better than us,” said Duff. The plaintiffs, who are waiting for the state Supreme Court to hear their case, are opposed to such an approach. Districts currently get an extra 30 percent credit in the formula over the foundation number of $11,525 – nearly $3,500 – for each student who qualifies for free- or reduced-priced lunches. Districts don’t necessary receive that much money for each student, because other components of the formula require districts to contribute a certain share locally, based on town wealth. Duff and Rojas propose giving districts that have high concentrations of poverty 40 percent over a foundation number. 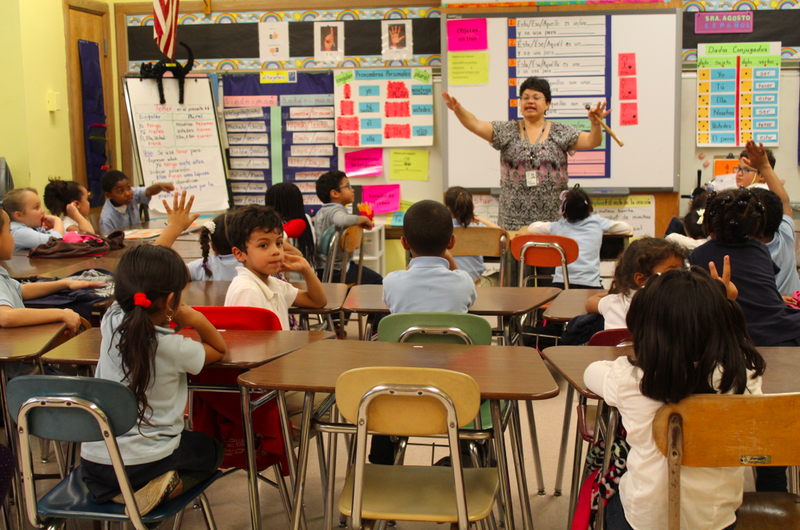 They also propose to begin giving extra weight for each student a district enrolls who speaks limited English: an additional 15 percent for districts with high levels of English learners and an extra 10 percent for all other English learners. These changes face little resistance and have been largely embraced by those interviewed by the Mirror. At the heart of the disagreement over Duff’s plan is his proposal to overhaul how the state calculates a town’s wealth, which ultimately measures the capacity of local taxpayers to fund their public schools. Town wealth currently is based almost entirely on taxable property. This has left officials from places like Norwalk and Stamford complaining that, while the houses in their communities may be worth a lot, the average household income is middle-of-the-pack – and residents are not able to afford a huge tax bill to fund schools. Duff proposes changing this methodology, using a 50-50 weighting of a town’s taxable property and its median household income. The current weighting is 90-10. Rojas does not yet have an opinion on this component. But lobbyists, union leaders and some Democratic legislators are having a hard time seeing past what such a shift would mean for Duff’s district of Norwalk – compared to significantly more impoverished districts such as Hartford and Bridgeport. A draft run of a funding formula that looks to be nearly identical to the one proposed by Duff was compiled by the School Finance Project, and Norwalk stood to gain $24.8 million when the new formula was fully phased in over six years, a 162 percent increase. By comparison, Hartford, would get $6.8 million more, a 3 percent increase. New Haven would land $11.8 million more, a 6 percent increase, and Bridgeport $26.9 million more, a 14 percent increase. Duff rejects that his motivation was to strongly favor his town over others. “The funding formula has been one that needs to work well for the entire state, not just a few communities, and so two-thirds of the communities do better here and that does include Norwalk here but there has never been an effort by me or anyone associated with me to somehow schew a formula in favor of my home district. This is an issue that is too important to the future of our state,” said Duff. Under the proposal, the Education Cost Sharing Grant – the state’s primary mechanism for aiding public schools – would increase by about $50 million in each of the next six years. Such phase-ins have been regularly promised before, and the failure to deliver them is largely to blame for disparate funding levels among towns. Facing fiscal constraints, legislators for years have capped the grants. Without the cap, the state would have had to provide $599.6 million more than it has in this fiscal year, reports the legislature’s nonpartisan fiscal experts. Because of all the adjustments over the years, the rate at which town ECS grants are funded varies drastically. For example, Farmington is slated to receive 180 percent of what the formula calls for this fiscal year while its neighbor West Hartford will receive just 58 percent. The state is facing even tougher fiscal years ahead, but Duff and Rojas don’t seem deterred by the history. 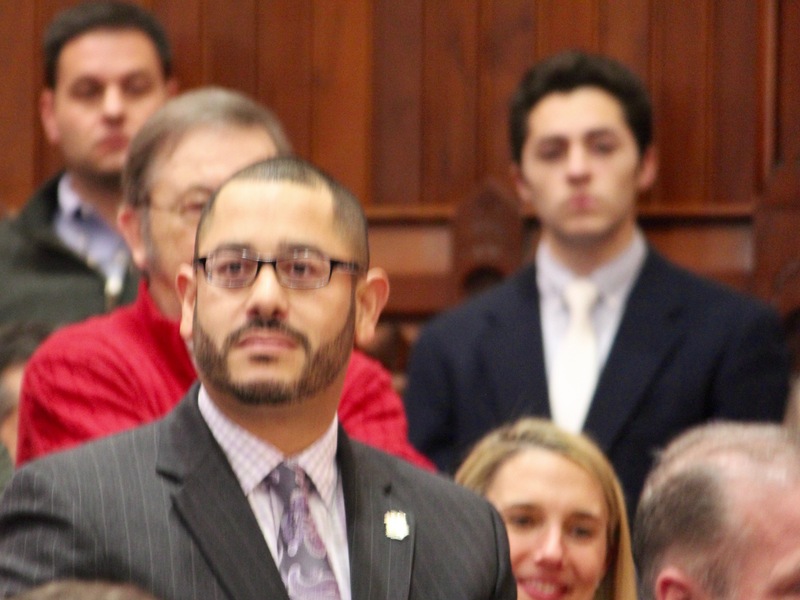 Rojas, who co-chairs the legislature’s taxing committee, was more blunt: The only way any major overhaul for school finance will be accomplished is by having nearly every community get more money. The proposal would give 133 towns – 79 percent of the state’s public school districts – increased funding, and every town would get a minimum level of state aid. Malloy has taken issue with this so-called hold-harmless approach, which shields everyone from cuts and has driven how the state funds education in the past. His budget proposal recommended keeping level the total funding for the state’s primary education grants but redirecting aid from the most affluent communities to the worst-off districts. However, he also is recommending towns pick up one-third of the costs of their teacher pensions for the first time, which could actually lead to reductions in education spending in the lowest-achieving districts. Even more controversial is Duff and Rojas’s proposal for funding charter and magnet schools and other choice programs. Currently, separate funding formulas or set amounts written into state law govern funding for various school choice programs. Duff and Rojas want to end that and instead have all schools funded under the same formula used for traditional neighborhood schools. However, there is one exception — and that’s where the controversy is rooted. Since charter, magnet and other choice schools don’t have a local tax base and are primarily supported by state funding, Duff and Rojas propose the state calculate how much each local district spends to educate a student on average and then withhold one-quarter of that amount for each student who leaves for a magnet or charter school. The withheld funding would be sent to the school the child actually attends. Currently districts do not get funding for students who leave for charter schools. However, districts still get state funding for students who leave for magnet schools, which is somewhat offset by tuition that magnets charge the sending districts. The changes that Duff and Rojas propose would drive huge funding increases for several charter schools — including about $1,800 more per student for Achievement First Hartford Academy and $1,700 for Stamford Academy, according to a preliminary run done by the School Finance Project. Four of the state’s 22 charter schools would lose funding, with the largest being Explorations Academy, which would lose $475 per student. 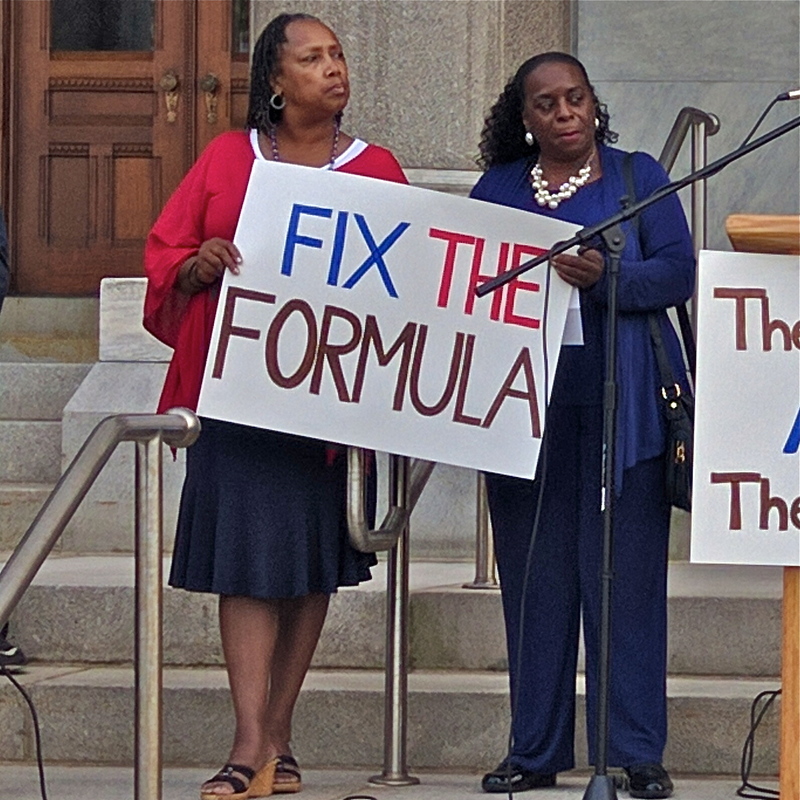 The network of regional magnet schools opened in the Hartford region in an effort to comply with a Connecticut Supreme Court order to desegregate Hartford schools would be hit hard by the changes, with a loss of $3,569 per student. Rojas and Duff said more money should leave than currently does when a student leaves to attend a charter or magnet school — but others see this as an effort to drain more money that would have gone to neighborhood schools. “It’s a public school voucher plan. This is the Michigan model,” said Waxenberg, referring to the controversial approach Betsy DeVos successfully got into place in Michigan before becoming the U.S. education secretary. Duff denies it’s a voucher plan.